Thank you to everyone who helped make this center possible! We were thrilled to celebrate the brand-new Comcast Technology Achievement Center at Eastside Adult Services with our Grand Opening & Ribbon Cutting Celebration on Wednesday, February 28th. We would like to extend a big thank you to all those who attended and celebrated with us. We would also like to extend a very special thank you to Comcast, WATAP, all of our guest speakers, and key Easterseals Washington staff that made this all possible - Jill Braun, Sarah Lowes, Samantha Ungeheier, and Moses Lo. The event was full of excitement and energy as Easterseals stakeholders, elected officials, board members, participants, particpant families and staff members networked, tested out the equipment, and shared the positive impact this fully-accessible computer lab is already having on our participants and their families. Speakers at the event included Cathy Bisaillon, Easterseals Washington President & CEO; Marianne Bichsel, Comcast WA Region VP of External Affairs; Councilmember Janice Zahn, Bellevue City Council; Alan Knue, Washington Assistive Technology Act Program (WATAP) Director; and Jill Braun, Easterseals Washington Eastside Adult Services Program Director. Each speaker spoke to the importance of inclusive programs like this in the community and the incredible impact companies like Comcast are making in our communities when they invest in these projects. More accesible technology on the way! 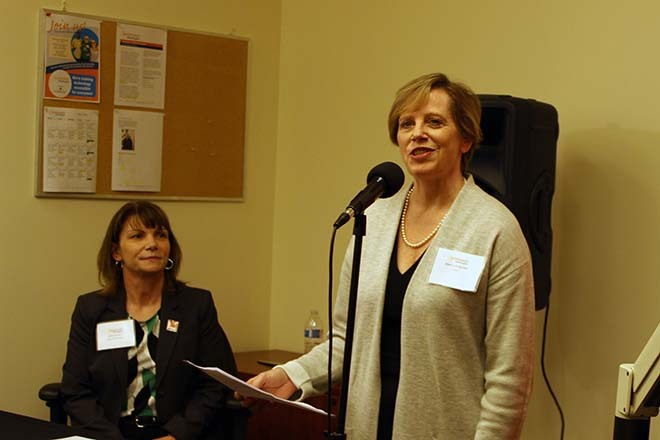 Marianne Bichsel, Comcast WA Region VP of External Affairs shared a big announcement at the event. 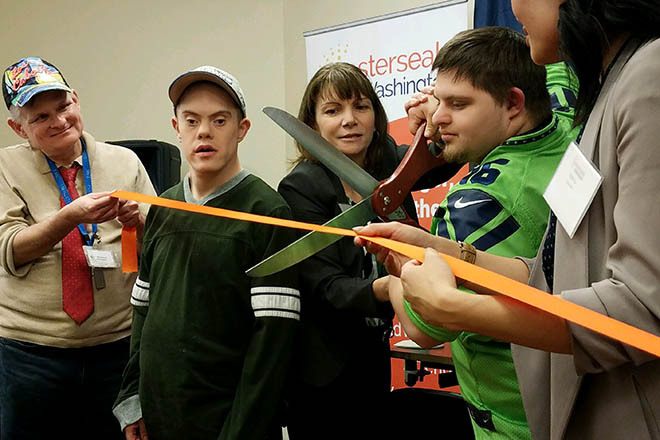 We are honored to officially announce that Comcast has awarded Easterseals Washington an additional $20,000 grant to fund Comcast Technology Achievement Centers in both our Des Moines and Bremerton Adult Service Centers. We look forward to launching those two new programs and creating more opportunities for adults with disabilities in these communities. Throughout the event we heard from participants that have been using the new technology - participants like Kevin and his mom Hayat. Kevin has been in the program since July 2015. He is 23 years old and the biggest sports fan you could meet! He shared his excitement about developing his technology skills when attending Eastside Adult Services. Kevin's mom shared her appreciation for programs like this that invest in her son and his development. We concluded the evening with participants cutting the official ribbon on this program - and we could not be more proud! What is the Comcast Technology Achievement Center? In July 2017, Easterseals Washington announced that we had been awarded a $20,000 grant from the Comcast Foundation to build a new Technology Achievement Center at our Adult Day Center in Bellevue, Eastside Adult Services. We are now excited to announce that the Comcast Technology Achievement Center is officially open to program participants, and already we are seeing the incredible impact. Eastersesals Washington adult day health and recreation centers serve young adults with autism, seniors with dementia and other disabilities related to aging, and adults of any age with mobility or sensory issues. With heightened expectations of adult service centers to develop educational and vocational goals that help each individual achieve greater independence, this new Comcast Technology Achievement Center promises to impact the lives of 80+ people with disabilities at our Bellevue center. 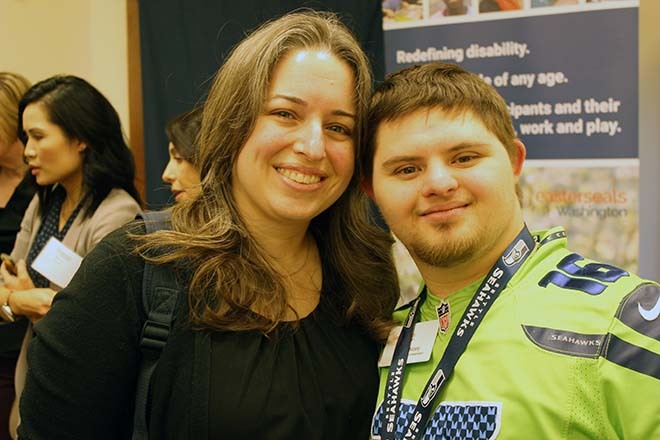 Easterseals Washington was one of six local Easterseals affiliates across the country selected for the grant by the Comcast Foundation through the Comcast NBCUniversal Assistive Technology Grant Fund. 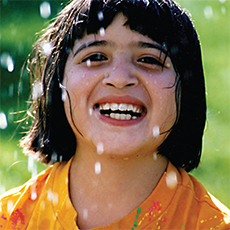 Established in 2011, the fund supports technology programs and services that benefit children and adults, including veterans living with developmental disabilities. Assistive technologies can vary from braille-equipped handheld computer systems and voice command telephones to height adjusted tables and augmentative communication systems – all helping individuals with disabilities to overcome barriers in the home, on the job, at school or on the go. Since 2011, The Comcast NBCUniversal Assistive Technology Grant Fund has empowered nearly 50,000 Americans living with disabilities by providing expanded assistive technology training and services. To date, Comcast NBCUniversal has provided more than $25 million in cash and in-kind support to help with Easterseals’ assistive technology efforts. Thank you Comcast! To help us transform our vision in to reality, Easterseals Washington partnered with Washington Assistive Technology Act Program (WATAP) to ensure we created an environment that was fully accessible to all of our participants, assisting each of them in reaching their own individualized goals. The staff at WATAP is nationally recognized for their expertise and leadership in the areas of assistive technology, accessibility of IT and other disability related research and study. WATAP’s team helped direct us through all the necessary planning, ordering of hardware and software, and managed installation, and implementation. They have also provided training to our staff on outlining how to use the Comcast Technology Achievement Center, and guidance on how to conduct workshops for additional staff, participants and their caregivers. The primary goal of the Comcast Technology Achievement Center (TAC) is to create a space that gives our participants access to gaining skills in socialization, communication, memory, job development, community access, independence, computer literacy, improving vocabulary, motor skills and much more. It will help participants communicate, grow, and engage more with their peers, families, and communities. Additionally, the center will function as an integral part of the daily programming at Eastside Adult Services. 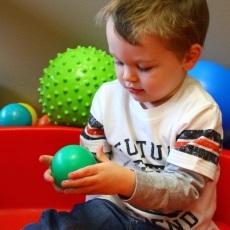 During two daily activity times (with focuses on communication, movement and exercise, memory, and assistive technology), 7-10 participants will have access to the TAC. Outside of these structured times, participants will be able to access the center in smaller groups or with 1:1 instruction. The Comcast Technology Achievement Center will be available to all 80 of our participants, and over 240 family members and caregivers. This is so exciting – new worlds will be opening up for both participants and staff! We're already seeing an impact! Ben, a young man who relies on limited sign and nonverbal cues, was able to tell us that his favorite color is red, and his favorite food is a milkshake. He was able to answer questions from staff and other participants. He was more engaged in program activities. 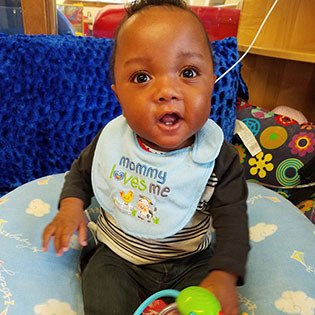 We learned SO much about him and what his interests are because we were able to provide interactive tools for him to communicate," shared Jill Bruan, Program Director, Eastside Adult Services. "Another participant participated in a dice game activity – this is a participant who I have never seen participate in any activity in the 7 months I have been here – and it was because she had access to a communication device. We discovered that she is a jokester! It was the first time I have witnessed true interaction with this participant and her peers. And it was clear how proud she was of herself. It was amazing." We look forward to sharing more from our Grand Opening & Ribbon Cutting Celebration soon, along with more stories of impact. Get connected with the Eastside Adult Services Program. Learn more about Comcast in Washington State.